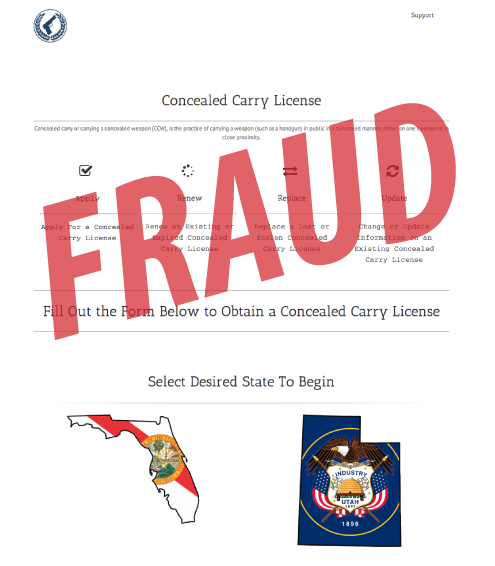 Consumers should be aware of a fraudulent website (www.concealed-license.com) that promises concealed weapon licenses for Florida. This site is not in any way affiliated with the Florida Department of Agriculture and Consumer Services, the only official authority to offer concealed weapon license for the state of Florida. Do not provide this site with any personal information. Consumers that have utilized this fraudulent site are asked to notify the department at 1-800-HELP-FLA or file a complaint. Interested in applying for or renewing a concealed weapon license or obtaining more information? The Florida Department of Agriculture and Consumer Services administers the concealed weapon license program. NOTE FROM INVESTIGATIVE TACTICS: We offer the CLASSthat is required to apply for the Florida (and many other states') Concealed Weapons License (also called a Concealed Weapons Permit CWP/Concealed Carry Weapon CCW).